This week’s Featured Application comes to us from Bobby Baughn and his team at STI of Atlanta. 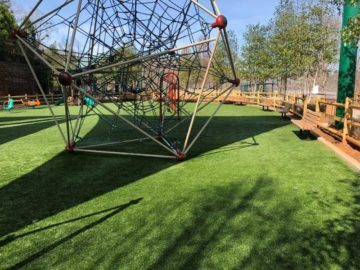 Baughn and his team replaced more than 10,000 square feet of turf at the playground at Morgan Falls Overlook Park in Sandy Springs, Georgia. 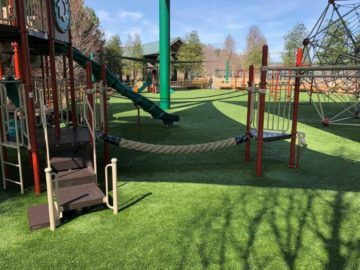 The team installed SoftLawn® Kentucky Blue over existing foam pads to provide a very soft (and safe) surface at this very busy park. “We were able to reuse most of the foam pads except for a few spots underneath the swings and at the ends of a few slides,” said Baughn. Most of the rolls were 80 feet in length, which created a few challenges, particularly around the playground structures. The team wanted to make minimal cuts and seams around the equipment. The playground was Phase One of the Morgan Falls project. The team installed Phase One in January of 2019. The STI of Atlanta team also installed a second Phase at Morgan Falls. Phase Two overlooks the Chattahoochee River. 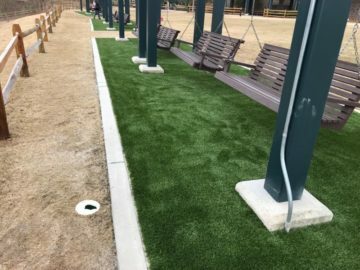 Baughn replaced the turf underneath three relaxing swings. 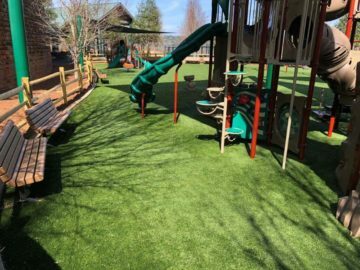 They used over 1700 square feet SoftLawn® Kentucky Blue for Phase Two, only with no foam padding beneath the turf. The team also replaced the existing Nailer Boards with a new composite Nailer Board so they could secure the edges. STI worked with Sourcewell (formerly NJPA) to secure this public project. Sourcewell is a Co-operative Purchasing program that focuses on public projects of all kinds. 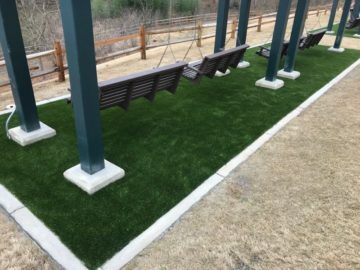 Synthetic Turf International is an AWARDED CONTRACT vendor for Sourcewell, and have been since 2015.